More serious periodontal diseases, while relatively uncommon, can affect children and teens as well as adults. Aggressive periodontitis, for example, results in connective and bone tissue loss around the affected teeth, leading to loose teeth and even tooth loss. 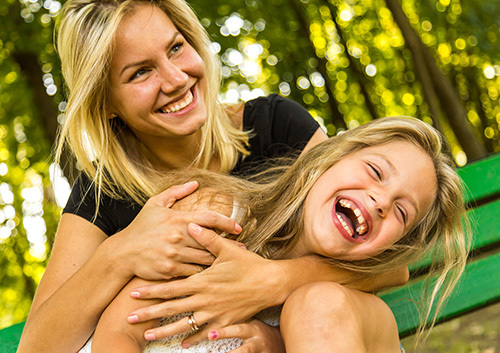 Let Dr. Pamela Clark know if you have a family history of gum disease, as that might be a factor in your child’s dental health, and tell us if you have noticed any symptoms of gum disease. The best treatment for childhood gum disease is prevention. Careful brushing and flossing and regular visits to our Pearland, TX office for a professional cleaning will stop gingivitis from developing and from becoming a more serious form of gum disease. We will take care to look for any signs of gum problems, and have suggestions for you if your child is at greater risk for periodontitis. Together, we can encourage gentle and proactive gum care, and check off one more goal accomplished on your child’s path to lifelong dental health! April has arrived and with it comes lots of exciting things. First up, we’ve got Easter. Who doesn’t love indulging in a chocolate bunny? They’re cute, delicious, and can be easily cleaned off of teeth! A win across the board. For us, Easter is an important Christian holiday that is celebrated not only with activities like Easter egg hunts and dyeing eggs but with family gatherings and Sunday sermons to reflect on all of our blessings. Dr. Clark is looking forward to spending more time with her family over the Easter holiday enjoying the beautiful spring weather. Her goal for the month is to be outside more and be consistently active, so it looks like there will be many bike rides and picnics in her future. If you’re spending more time outdoors like we are this spring, don’t forget to wear your mouthguard. Especially if you’re participating in sports that put your teeth at risk like baseball (go Astros!). This month is also host to Earth Day. This is such an important day to spread awareness about the importance of taking care of our planet. If we all chip in a little bit in our day-to-day lives, we’ll not only make it a better place for ourselves but also for future generations to come. Our team at Pearland Pediatric Dentistry is on a mission to recycle all of our plastic and paper waste! If you’re just getting started on your eco-friendly journey, try starting with purchasing items that are reusable instead of disposable. It could be as simple as bringing in your own coffee cup when you’re purchasing your morning coffee. That’s one less paper cup that will be used. Being eco-conscious can also be as easy as being mindful of how much energy you’re using. If you’re brushing your teeth, for example, don’t leave the water running the entire time! Use it only when you need it. We hope you’re all having a lovely month so far. Don’t forget to check out our spring decor the next time you visit us in the office! 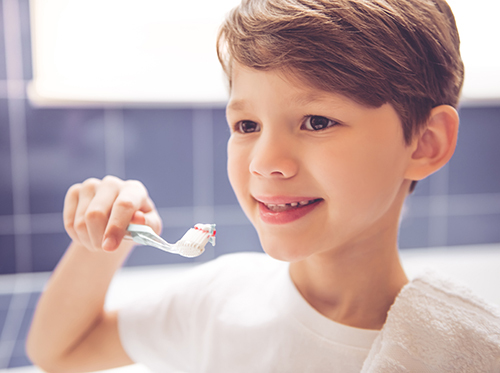 Here is some surprising yet worthwhile advice you might be hearing for the first time: Brushing can be incredibly bad for your child’s teeth if done right after eating certain foods. Enamel is an extremely hard mineral on the exterior of each tooth. It’s actually the hardest substance in the human body: It’s even stronger than bones! Its only weakness is that acids in the food we eat can easily destroy enamel. Healthy teeth thrive in an environment that has the proper pH balance. That ensures the mouth doesn’t start the process of demineralization—the process when alkaline turns into acid, which attacks and softens the enamel on the surface of your child’s teeth. Pores and fissures form, and that’s when the harmful bacteria go to work. A mouth’s pH level fluctuates depending on what is eaten throughout the day. Examples of the most common highly acidic foods include citrus fruits, soda, and sugary foods. Highly acidic foods tip the balance of pH in the mouth from a healthy alkaline to a dangerous acid. Can brushing your child’s teeth immediately after a meal lead to even more damage? The answer is yes! Eating highly acidic foods causes your child’s teeth to be more susceptible. If your child brushes when the teeth have been weakened by acids, even more destruction can happen to the enamel. 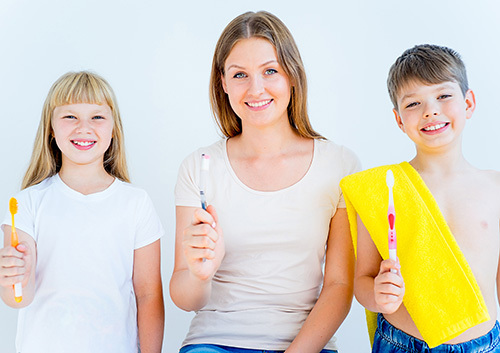 Your child’s toothbrush bristles will actually wear away some of the enamel. So it’s healthier for your child to wait at least an hour after eating or snacking to brush. These practices help produce saliva, which in turn restores a healthy pH level in your child’s mouth and coats the teeth with minerals they need. Once your child’s mouth is restored to a healthy pH level, he or she may brush normally. Keep in mind that acidic foods can weaken the enamel on the teeth and take the right measures to prevent spiking pH levels. Still have questions? 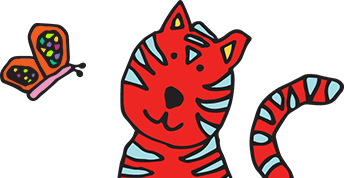 Call our Pearland, TX office and schedule an appointment for your child with Dr. Pamela Clark.